Anna is the daughter of an American couple working in Cairo. Layla is the daughter of the doorman in Anna's apartment building. Together they strike up an unlikely friendship that is put to the test when both girls are faced with family health crises at home and revolutionary unrest on the streets. As Anna and Layla reckon with illness, risk, and loss in different ways, they learn the power of friendship and the importance of hope. Ultimately, they must recognize that there is still time to fight for a better tomorrow, together. "Through its story of intercultural friendship and its backstory of international and interdisciplinary collaboration, Lissa invites us to take an unusual - fictional, graphic- and highly original path to the heart of the ethnographic encounter. It is a journey I am excited to take with my students, and I look forward to seeing the next titles in the ethnographic series." - Martha Radice, Dalhousie University - Anthropologica 60, 2018 "The storytelling in LISSA is innovative in the sense that it shows people's lives without resorting to broad stroke generalizations. The novel also nicely covers key aspects of cyber-activism, social media and texting - tools that were instrumental in communicating during the revolution." - Eduard Cousin Lissa is an eminently teachable text, and it was clearly designed with the classroom in mind. - Christine Sargent, Anthropology Book Forum "Revolution is as intimate as family and as mammoth as regime change in this graphic novel focused on the 2011 Tahrir Square demonstrations. This is the book's greatest strength: its belief in decency, even amidst violence and trauma. Its hopeful mood is mirrored by the book's rounded, flowing visuals: Bandages flutter like hair ribbons, water sluices down Anna's surgical scars, and Layla's eyes are wide as she tends to the grievously wounded. This is a chronicle of conflict, to be sure, but it is also a tribute to persistence of friendship and the power of a people united." - Publishers Weekly "I have nothing but admiration for this book. The story is compelling--even a page turner. Moreover, it is informative, historically and culturally situated and uplifting--or, at least, it ends on a hopeful note--teaching hard truths, or glimpses of them, in an accessible and digestible way." 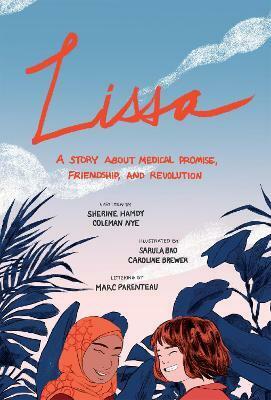 - Shelly Errington, Anthropology Now "Whether you read Lissa to educate yourself about health issues or research methods, or you just want to find out what happens to Layla and Anna, this graphic novel shows the huge and still untapped potential of comics for use in medicine and global health." - The Lancet "In Lissa, Hamdy, Nye, their artists Bao, Brewer, and Parenteau show us how we can collaboratively transform anthropology's ways of seeing and communicating depth and nuance in our ethnographies. As the first publication in the new ethnoGRAPHIC series from University of Toronto Press, Lissa sets a high bar and positive tone for what we can expect from this series. Like most great books, Lissa allows the reader to bring different meanings and needs to the book, engaging them in multiple conversations that explore the ways in which we are connected." - Somatosphere ..".offers slices of contrasting Egyptian and American biomedicines and uses the characters' dilemmas to pry open the contradictions within and between these medical systems." - Stacy Leigh Pigg, Medical Anthropology Quarterly "With the University of Toronto's imprimatur and its ethnoGRAPHIC series, surely there are no more excuses not to expand what counts as professional, promotion-worthy ethnography. And Lissa offers a fantastic model of how to proceed. Congratulations to its visionary authors and editors." - Lochlann Jain, Medical Anthropology Quarterly "The complexity of the various ethical and medical dilemmas gives the work depth and pathos without making the arguments appear didactic. It is indeed the ethnographic research--the minor characters and their voices--that give the book its special strength." Coleman Nye is Assistant Professor of Gender, Sexuality, and Women's Studies at Simon Fraser University. Sherine Hamdy is Associate Professor of Anthropology at University of California, Irvine.